The Appliance E.M.T. of Ogden, Utah, provides fast in-home appliance repair service in a professional, friendly, and timely manner to all of Weber County. We service Farr West, Harrisville, Huntsville, Hooper, Marriott-Slaterville, North Ogden, Ogden, Plain City, Pleasant View, Riverdale, Roy, South Ogden, Uintah, Washington Terrace, West Haven, Eden, Liberty, Taylor, Warren, and West Weber. Zip codes 84404, 84067, 84403, 84401, 84414, 84310, and 84317. For Appliance Repair Service in Ogden, Utah, Call 801-737-2911. It's not uncommon for a washer to quit draining. Sometimes this is due to foreign objects getting into the pump in the appliance. I have found hairpins, underwires, guitar picks, blood test strips, toothbrushes, pens, golf tees, socks, and complete bras inside pumps while I've done appliance repair in Ogden. Smaller delicate items can actually be washed in special garment bags that will keep smaller items out of your pump. We are the Professionals in Ogden, Utah for all of your appliance repair and service needs. We like to participate in the Cherry Days Parade in North Ogden. 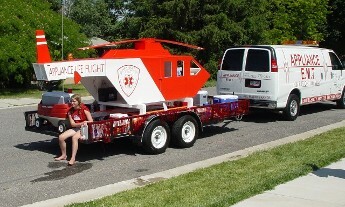 This was our float, a half scale life flight helicopter, to show how fast our appliance repair service in Ogden is. We don't really show up in a helicopter, but we do hustle to fix your washer, dryer, dishwasher, oven, refrigerator, microwave, or garbage disposer. This is Lainie sitting on the back of the float right after she saved my son's life. He fell off the float and landed in front of the trailer wheels. The float was only rolling two miles per hour, but she grabbed him before he got hurt worse. Thank you Lainie. You rock! Make sure to call us today in Ogden at 801-737-2911. 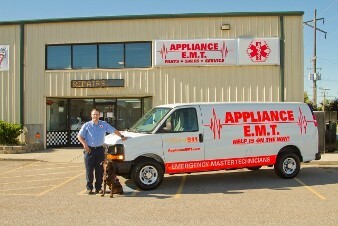 At the Appliance E.M.T., Help Is On The Way! 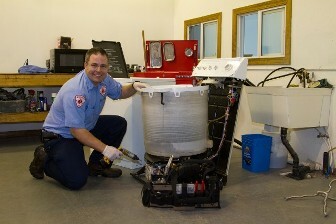 We service and repair appliances In Ogden.